I don’t think I’d be doing the humble Scotch egg an injustice to suggest that it’s got a bad reputation. The true horror of the mass produced Scotch egg, mainstay of the wet British picnic, can be found in any supermarket in the land. Dull, grey, under seasoned meat hugging an overcooked egg, the whole lot coated in fluorescent breadcrumbs that suggest some sort of food additive derived from raw nuclear waste. At their worst, as they so often are, the Scotch egg is an abomination, a wholehearted and shamefaced offence against all that’s good in the world of food. I’ve eaten Scotch eggs that would have been perfectly usable in one of those floodlit cricket matches where they need a ball that can be seen easily. So, does it always have to be this way? No, you’ve probably guessed by now that it doesn’t. As with many mass produced things, you can either make it in bulk, or you can not bother and make it freshly and properly in small batches. If you break it down, a Scotch egg is nothing more than a hard boiled egg wrapped in pork, coated in breadcrumbs and deep fried. There’s very little not to like there. 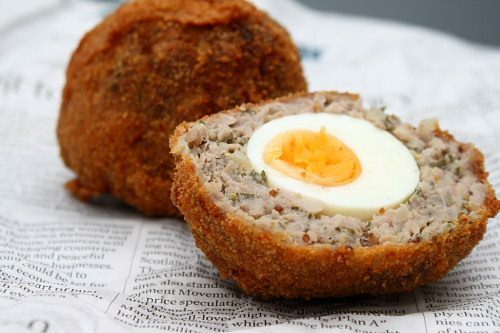 Wikipedia Extensive research tells us that the Scotch egg was probably invented by posh food shop Fortnum & Mason in 1738 as a novel way of shoehorning both eggs and sausage meat into a luxury picnic hamper. Whether this is true or not is debatable, but the inspiration may have come from a far older Indian dish, where eggs are coated in heavily spiced minced lamb and braised in a yoghurt based sauce. Eggs coated in heavily spiced minced lamb? That’s my kinda dish. More on that soon. There’s no real clue out there about why this not particularly Scottish snack is called a Scotch egg. It just is. To make your own, you need to start in the middle. Boil four medium sized hens eggs until they’re just set. Don’t overcook them – the centre should be a little wobbly so that it can firm up later in the hot oil. Making Scotch eggs with quail’s eggs is very popular, but it’s a mere fad, a pointless affectation. Chicken eggs only, please. Cool the cooked eggs quickly in a pan of cold water and shell them. Next, the pork overcoat. You need about 400g of good quality sausage meat for this. The best way to get hold of sausage meat is to just buy half a dozen proper butcher’s sausages and skin them. The success or failure of the finished Scotch egg is almost entirely dependent on how you season the meat. Feel free to go wild with the flavours, but remember that anything you add to the pork should be big and gutsy. My approach is fairly traditional – a medium-ish handful of sage leaves, finely chopped, a teaspoon of Dijon mustard, a finely chopped onion that’s been softened for a few minutes in a hot frying pan with some olive oil, a little too much black pepper and salt. Divide the pork mix into four and, taking a quarter of it, mould it around one of the eggs. Make sure that the sausage coating is even all around the egg. It should end up just a bit smaller than a tennis ball. Roll the ball in some beaten egg and then in some fine breadcrumbs. Slide the eggs carefully into a pan of hot oil, heated to 160c, and let them gently fry for about eight minutes. Nudge them with a spoon every now and again to turn them over. When the Scotch eggs are done, remove from the oil, drain on kitchen paper and allow to cool. Slice in half and greedily eat. …a pickled egg wrapped in a mixture of pork and black pudding? Yes, please. mmmmmm, ooh i could just eat that now….or two….or thr…nah, i couldnt eat three! but yes..they look goooooooood!!!! I adore Scottish eggs. I remember being totally blown away that I could BUY them in the UK. Sometimes I like making mini ones with quail eggs…. Ah, the scotch egg mystery. I came across a Thai version while in Bangkok. The ubiquitious Thai fish cake was used as a wrapping for quail, chicken and century eggs. We have something quite similar here in Singapore selling at the famous Tanjong Rhu bao place, and it's unapologetically Asian – hard boiled chinese egg, seasoned minced pork meat, and a light but chewy batter. No credits given, unfortunately. It's just called pork and egg. I'm going to have to make this to see what the fuss is all about! I love Scotch eggs (or are they Indo-Caledonian eggs?) Your description of the supermarket scotch egg made me laugh – it's so true. How can they get something so simple and tasty soooooooooo wrong. I like your idea of using minced lamb – will watch out for that recipe. ….get me the address and a plane ticket and I'll go have a word with Nancy and John! I love how you described what my son-in-law has been begging me to make. I never knew you could actually buy them ready-made in the UK. Scotch eggs may not be traditional Labor Day picnic fare in the US, but that's what I'll be making! Thank you! Scotch eggs are available everywhere in the UK, and they suffer because of it. Think yourself lucky that you'll have to make yours fresh! Your son-in-law has great taste – please pass on my regards. wow, i've never seen a Scotch egg before. that looks sinfully good. is turkey sausage use forbidden? Yum! I've only ever had homemade varieties so they are always good and I've always loved them (abomination that they are) and being from Scottish heritage it must be in the blood. This version sounds right up my alley! I never had a Scotch Egg until about 6 months ago at The Breslin in NYC, if you visit NY this place is highly recommended. Now I'm a huge fan. Your egg looks delicious. It is perfectly cooked. I hope to try making my own very soon. Thanks for sharing! Oh, good lord, I need to make these asap. Thanks for the great post! I don't think I've ever heard of these little beauties before! Here in the US, you generally only see what Americans consider Irish "pub grub", fish & chips, bangers and mash and of course, Guinness beef stew. I think it's high time we expand the menus here to include Scotch Eggs! Oh my, I've not eaten a scotch egg for years. Thanks for the reminder. The last time I made them I did use quails eggs which I think are even better for a party. Nice bite size eggs, yum. I've seen Scotch eggs showing up a lot lately…Iron Chef most recently, oh, and Top Chef last season. Before that, I didn't know what they were. I think they look amazingly delicious. Gosh, I'm hungry now. Well, thank you for the proper recipe and I'm feeling like I must try this. Cheers! I've never had these before! hmm new recipe to attempt! Wow they look great, I had a go at making them last year blog post here http://paganum.wordpress.com/2009/01/21/homemade-… and must try them again, one of my favorites and a lot easier than you think and so much better than the supermarket version! I've lived in the US for nearly 18 years and I recently got it into my head to make Scotch eggs – what can I say? I woke up one morning and realized I missed 'em! Thank goodness I found this recipe – none of the others seemed quite right, you know? Anyway – going to make them this weekend and will let you know how they turn out! I have never had a Scotch egg but this really sound delicious. Great post. Scotch eggs were indeed invented by F&M, the word scotch means to "Bastardise" i.e. to change the appearance of something, in this case it was the egg. Pullet eggs were the preferred choice back in the 1700's and they were made for the travellers and coachmen entering and leaving London. P.s. good blog, your game pie recipe is the same as mine to the letter, so it must be great!! Hi, just need to know,,, "how to make meat casing stick to egg,"? …the best way is to keep the meat mixture a tiny bit wet and then just mould it firmly around the egg…it takes a couple of tries to get it right. Hi, many thanks,will certainly try your way in the coming week,sounds ok, thanks again,I'll let you know. Love home made Scotch Eggs – hot and cold. It is Easter Sunday and that is what we are going to have as I have just bought a mini deep fryer. Sage and Mustard sounds good. Mum always mixes some Sage & Onion stuffing mix into the breadcrumbs for a nice flavour.